RBSE board exam papers with solution are issued by board of secondary education rajasthan (R.B.S.E.) 2017. These previous year question paper 2016-2017 are in PDF format to download for all subject for those students and teachers who are linked to RBSE government affiliated schools. Download the Free PDF of 2017 last year question paper to prepare for your RBSE board examination this paper will help students as a study material/ guide for 2018 RBSE examination, Get free solutions for RBSE previous years question paper for class 12 (Mathematics, English, Physics, Biology, Economics, Accountancy, Business Studies) the online model answer will clear your doubt on this sample question papers are the smart way to prepare for exams and a sure-short way to ace for those appearing for board exam 2018 as they familiarise students with pattern of the paper, Important question , question bank, and the weightage of each chapter in RBSE 2018 Board exam. These board RBSE papers 2017 are the best revision tools and must be made an integral part of exam preparation. 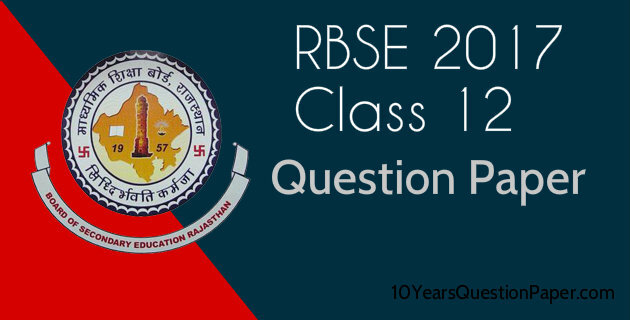 Tags: Rajasthan board, RBSE question paper, previous years question paper of RBSE, 2017 RBSE sample paper, 2017 board question paper, 2017 RBSE last years question paper, 2018 board question paper, last years 2017 previous years question paper, all subject previous years question paper, rajasthan sample paper of class 12, class XII board question paper, RBSE class 12 board question paper, 2017 rajasthan board previous year question paper all subject.